Why Must I Face These Demons I Embrace? The discovery of something profound that has escaped my attention for some time came to me today in my research for self discovery. For a long time I have always identified, tested, and found that I have a high affinity with the Enneagram type 5, or the Investigator / Observer personality type. This is especially true for the childhood dynamic that I am working with if looked at carefully. Today, after researching further, I came to some new developments in my personality type. I have retested (RHETI – Riso Hudson Enneagram Type Indicator Test) and found that I also strike an affinity with the type 4, or the Individualist / Romantic personality type. Why must I face these demons I embrace? I knew I had a cross-over on some of these types, and thought that these differences were more in my Triadic wing associations with other types. There are two Triads that are in alignment with type 4 and type 5 that are important for transformational work because they specify where our chief imbalance lies. The Triads represent the three main clusters of issues and defenses of the ego, self, and they show the principal ways in which we contract our awareness and limit ourselves. The Feeling Triad for my type 4 is concerned with self-image (attachment to the false or assumed self or personality). Fours believe that the stories about themselves and their assumed qualities are their real identity. Underneath their ego defenses these types carry a great deal of shame. The Thinking Triad for my type 5 is concerned with anxiety (they experience a lack of support and guidance). Fives engage in behaviors that they believe will enhance their safety and security. Underneath their ego defenses these types carry a great deal of fear. Type 4 the Individualists and Type 5 the Investigators look alike because as wings of each other, they share some of the same personality traits. Both can be analytical, introspective, internalized, sensitive, and shy (yet seem superior). Depending on how much they are influenced by their wings, some Individualists will appear more detached and some Investigators more in touch with their feelings. However, Individualists are the most feeling and emotional type-wanting more from others and having difficulty keeping their personal boundaries. In contrast, Investigators are the most detached type-wanting less and keeping more self-contained with clearer personal boundaries. What is funny is the dualism between these types as they can clearly be viewed as operating within different Triads. The four stems from the feeling and emotional experience, and the five stems from the thinking and reasoning experience which both are fundamental to a person when these triads operate together, yet can often separate and detach themselves from working together to find a balance in a persons motivational sources. 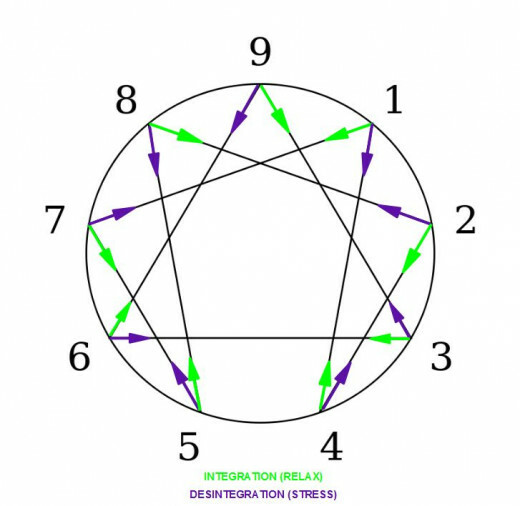 There are 3 levels with 3 variants in each level having horizontal and vertical dimensions for the Enneagram. There are 3 Healthy levels, 3 Average levels, and 3 unhealthy levels. Depending on your basic core type of personality, you also have “wing” subtypes that aid in the understanding of your personality. These lead to the directional levels of integration, or ways in which you can develop yourself into healthier persona’s. There is also the directional levels of Disintegration, or ways that you can subject yourself to the unhealthy trappings of your persona. The fundamental principle I lost sight of: Everyone has a deep and complete connection to all others and all things. What I came to believe instead: People experience a painful loss of their original connections, leaving them feeling abandoned and feeling that they are missing something important. Because of this strategy, by attention is on: What is positive and attractive about the future and the past. What is missing or distant that I long for and feel lonely without. What is aesthetically pleasing and deeply touching or meaningful. I put my energy into: Intense feelings of sadness and longing, associated with what seems to be missing or lacking in my life. Finding love, meaning, and fulfillment through self-expression and deep connection. Creating myself to be a unique individual. I do everything I can to avoid: Being rejected, abandoned, not heard, or insignificant. Feeling I do not measure up. Feeling there is something wrong with me. The mundane People and experiences that lack emotional depth. My strengths: Sensitivity. A creative orientation. Being attuned to feelings. A capacity to empathize with suffering. Intensity. Passion. Romantic idealism. Emotional depth. Authenticity. Introspection. What causes me stress: People and experiences not living up to my romantic ideals or desire for intensity. Wanting more than is available. Envying what others have that I do not have or what they are that I am not. Unmanageable feelings, especially in emotional crises. What make me angry: People who disappoint me, let me down, or leave me. Remembering such people from my past. Being slighted, rejected, abandoned. Feeling misunderstood. Phoniness and insincerity. The ultimate goal of my development: To realize that in the present moment we are loved and completely whole, lacking no essential quality or ingredient, that we are interconnected and at one with all life. How I can further my personal development: Focus on what is positive in life right now rather than on what is missing. Maintain a consistent course of action despite fluctuating and intense feelings. Participate in physical activity and helping others in order to become less self-absorbed. Delay reacting until intense emotions begin to subside. Appreciate ordinary everyday experiences. What hinders my personal development: Letting my strong feelings run the show and falling into inaction. Resisting changing “who I am” for fear of losing my individuality. Feeling I won’t measure up. Feeling the world will let me down. Getting self-absorbed. Downplaying improvement that is not dramatic and becoming discouraged. How others can support my development: Encourage me to keep my attention on what is positive in the present. Honor my feelings and my idealism. Reveal their real feelings and true reactions. Let me see that they really understand me instead of trying to change me. Fours keep up their identity by seeing themselves as fundamentally different from others. Fours feel that they are unlike other human beings and, consequently, that no one can understand them or love them adequately. They often see themselves as uniquely talented, possessing special, one-of-a-kind gifts, but also as uniquely disadvantaged or flawed. More than any other type, Fours are acutely aware of and focused on their personal differences and deficiencies. One of the biggest challenges Fours face is learning to let go of feeling from the past; they tend to nurse wounds and hold on to negative feelings about those who have hurt them. Indeed, Fours can become so attached to longing and disappointment that they are unable to recognize the many treasures in their lives. There is a Sufi story that relates to this, about an old dog that had been badly abused and was near starvation. One day the dog found a bone, carried it to a safe spot, and started gnawing away. The dog was so hungry that it chewed on the bone for a long time and got every last bit of nourishment that it could out of it. After some time, a kind old man noticed the dog and its pathetic scrap and began quietly setting food out for it. But the poor hound was so attached to its bone that it refused to let go of it and soon starved to death. Fours are in the same predicament. As long as they believe that there is something fundamentally wrong with them, they cannot allow themselves to experience or enjoy their many good qualities. To acknowledge their good qualities would be to lose their sense of identity (as a suffering victim) and to be without a relatively consistent personal identity (their basic fear). Fours grow by learning to see that much of their story is not true–or at least it is not true anymore. The old feelings begin to fall away once they stop telling themselves their old tale: it is irrelevant to who they are right now. The result is that Fours believe that something must be profoundly wrong with them, launching them on a lifelong “search for self.” They feel “If I am not like my parents and I cannot see myself in them, then who am I?” This also predisposes Fours to focus on what they lack –on what is missing in themselves, their lives, and their relationships. They feel abandoned and misunderstood by their parents and, later, by other significant people. As a result of this pattern, Fours respond powerfully to people who trigger their desire for mirroring, for being seen and appreciated for who they are. On the most profound level, Fours are always looking for the mother and father they feel they did not have. Fours are the deep-sea divers of the psyche: they delve into the inner world of the human soul and return to the surface, reporting on what they have found. They are able to communicate subtle truths about the human condition in ways that are profound, beautiful, and affecting. In a fundamental way, Fours remind us of our deepest humanity – that which is most personal, hidden, and precious about us but which is, paradoxically, also the most universal. Because of their attunement to their inner states – to their subconscious feelings and impulses – Fours are usually highly intuitive, an attitude that feeds their self-discovery and creativity. Although they may have intellectual gifts, they tend to rely primarily on what their intuitions are telling them about themselves and their environment from moment to moment. Often Fours are not sure how they are able to arrive at their insights; they find the inner workings of their consciousness mysterious and surprising. At the highest functioning level 1 in a healthy Four they let go of the belief that they are more flawed than others and are thus freed from their self-absorption. Their basic desire, to find themselves and their significance, is also achieved and thus their problems with their identity and its stability are solved. They are self-renewing, redemptive, and revelatory. The fundamental principle I lost sight of: There is an ample supply of all the knowledge and energy everyone needs. What I came to believe instead: The world demands too much from people and gives them too little. The strategy I developed to cope with this belief: I learned to protect myself from intrusive demands and being drained of my resources by becoming private and self-sufficient. I do this by limiting my desires and wants and by accumulating a lot of knowledge. I developed a sense of avarice, but only for things I would not do without. Because of this strategy, my attention in on: The intellectual domain. Facts. Analysis and compartmentalized thinking. Intrusions or demands on me. I put my energy into: Observing from a detached stance. Learning all there is to know about a subject. Thinking and analyzing in advance. Dampening and reducing feelings. Self-containment, withdrawing, conserving. Maintaining sufficient privacy, boundaries, and limits. I do everything I can to avoid: Strong feelings, especially fear. Intrusive or demanding people or circumstances. Feelings of inadequacy and emptiness. My strengths: Scholarliness. Being knowledgeable. Thoughtfulness. Calmness in crisis. Being respectful. Keeping confidences. Dependability. Appreciation of simplicity. What causes me stress: Failing to keep up sufficient privacy, boundaries, and limits. Becoming fatigued. Having desires, needs, and wants that lead to dependency. Trying to learn everything there is to know before taking action. What makes me angry: Being considered factually incorrect. Demands, intrusions. An overload of emotional input. Not having the opportunity for enough private time to restore my energy. The nature of my anger: Self-containment and withholding. Tension and disapproval, short bursts of temper. The ultimate goal of my development: To realize that there is a natural and sufficient supply of what is needed to support and sustain life, that staying engaged in life will not deplete our resources and energy. How I can further my personal development: Allow myself to experience feelings instead of detaching and retreating into my mind. Recognize that withdrawing and withholding invite intrusion. Take action, realizing that I have ample energy and support to carry it off. Participate in physical activity. Find ways to engage in conversation, to express myself, and to reveal personal matters. What hinders my personal development: Minimizing needs and detaching from the ongoing flow of life. Missing opportunities to do things with others. Isolating myself from my feelings and from connecting with others. Not recognizing fear or anger in myself. Reluctance to discuss and reveal personal matters. Excessive analysis. How others can support my development: Respect my need for privacy and space. Make clear distinctions between requests and demands. Provide moderate feedback about their own feelings and concerns. Encourage me to be self-disclosing and to express my feelings in the here and now. Appreciate my sensitivity. Appreciate my ability to live and let live. Fives want to find out what things are the way they are. They want to understand how the world works, whether it is the cosmos, the microscopic world, the animal, vegetable, or mineral kingdom – or the inner world of their imaginations. They are always searching, asking questions, and delving into things in depth. They do not accept received opinions and doctrines, feeling a strong need to test the truth of most assumptions for themselves. Behind Fives’ relentless pursuit of knowledge are deep insecurities about their ability to function successfully in the world. Fives feel that they do not have an ability to do things as well as others. But rather than engage directly with activities that might bolster their confidence, Fives “take a step back” into their minds where they feel more capable. Their belief is that from the safety of their minds, they will eventually figure out how to do things – and one day rejoin the world. Fives spend a lot of time observing and contemplating. Knowledge, understanding, and insight are thus highly valued by fives, because their identity is built around having ideas and being someone who has something unusual and insightful to say. Young Fives typically spend long periods on their own; they are quiet children who shy away from playing with others, instead occupying their minds and imaginations with books, practicing a musical instrument or playing with a computer, collecting insects or plants, or playing with board games or chemistry sets. It is common to find young Fives who are exceptionally advanced in some areas (such as spelling or mathematics). Thus Fives do not expect anything from others, except to be left alone to pursue their own interests unimpeded by anyone else’s demands or needs, especially their emotional needs. It is as if they were saying, “I won’t ask much from you if you don’t ask much from me.” Independence – or perhaps more accurately, non-intrusion – is therefore sought by Fives as a way of attaining safety and the feeling that they have control of their lives. Fives are psychologically stuck in the separation phase of childhood = the period around two to three-and-a-half years old – when children are learning to operate independently of their mothers. For whatever reasons, young Fives felt that the only way to become independent was to make themselves not want nurturing and emotional connection with their mothers. Thus, at an early age, Fives learned to cut off from painful feelings of need and longing by staying in their minds. Learning to cut themselves off from nurturance – even from desiring it – becomes a way of defending themselves against further hurts and frustrations. This becomes significant for adult Fives and explains their reluctance to become more emotionally engaged with others. To leave the safety of their minds, to reoccupy the body and feelings, is to re-experience the primal frustration and anguish of their infant selves. Such feelings completely overwhelm a Five’s capacity to focus their mind – their basis of self-confidence – and are therefore powerfully defended against. Even to want something ordinary too much could upset their inner security; thus adult Fives go through life avoiding the things they most want, repressing their longing and finding substitute pleasures in their interests, hobbies, and creativity. The Five’s main gifts to the world involve their tremendous insight and understanding, coupled with some area of expertise. Fives are extraordinarily observant and perceptive. They are sensitive to their environment and perceive subtle changes or discrepancies that others would likely overlook. Man Fives seem to have one or two of their senses developed to an unusual degree. Fives do not lose their childhood curiosity: they keep asking questions, such as, “Why is the sky blue?” or ” Why do things fall down and not up?” Fives do not take anything for granted. Fives enjoy sharing their findings with others, and they often serve up their observations of life’s contradictions with a whimsical sense of humor. They are endlessly amused – and horrified – by the unfolding strangeness of life, and they communicate this to others by changing the picture ever so slightly to expose previously invisible absurdities. There is a mischievous, sprightly, elfin quality to them. When we are really present to life, when we are relaxed and engaged in our bodies, we begin to experience an inner knowing or guidance. We are led toward exactly what we need to know and our choices come from this inner wisdom. But when we lose the ground of Presence out of which this Essential guidance emerges, the personality takes over and tries to figure out what to do. The “wrong turn” that Fives make is to become identified with their observations of their experiences rather than their experiences themselves. The Fives drive for knowledge and mastery is the personality’s attempt to re-create an Essence quality that we might call clarity or inner knowing. With clarity comes the Essential quality of non-attachment, which is not emotional repression or detachment but the lack of identification with any particular point of view. Liberated Fives remember the spaciousness and clarity of the Divine Mind, what the Buddhists call “the shining Void,” or Sunyata, the quiet, undisturbed vastness from which everything arises, including all knowledge and creativity. So where does that leave me? I cannot be both, or can I? I have always recognized my Five attributes, but somehow I can now identify with my Four attributes very clearly. I have overlook much because when I was first testing, I read much about the five and thought, gee that’s just like me. Unfortunately I stopped reading in depth about the other findings from the test that I overlooked much of my Four connections. I clearly show both qualities from the Thinking Triad and the Feeling Triad for these two types that are very close together in the Enneagram Diagram. What is perplexing is that I demonstrate an intense capacity to think about my feelings. A sort of dichotomous paradox that is the worst of all possible outcomes if in an unhealthy state. Because of the extreme lows of these types, It now explains so much of the suffering I have undergone in trying to establish my sanity I once thought was waning. This uncovers much to the complexity of the Enneagram, and the many levels of integration and deterioration one can assign fortuitous contingencies. I woke up from a bad dream again today. Dreams when we are in fear of something cannot be a good thing if they continue to divert your energies. I used to have childhood dreams (sometimes recurring) that placed me on an endless steep hill that continued to steepen as I walked upon it trying to reach the top, or when I was trying to run away from some hideous creature, my feet would melt into the ground and my legs would become immobile in my frantic attempt to free myself from the monstrous pursuer. Funny how the factor that was in my power became shorted, or the attribute that would give me an advantage from my dream-state adversary would be progressively disabled as the dream turned into a nightmare. The mind can be very powerful as well when you can feel your body undergo the physical states in your dreams such as falling (lucid dreaming). Why could I not incorporate having superhuman powers in these events to come to my aid and vanquish my nocturnal foes? I am capable of guiding my dreams, especially the good ones, where I am in a world of my creation, a world such as having a water filled environment with multiple ways of travel through my water filled city. I love to swim, so I think in my childhood I would have dreams that reflected some of my joys. Imagine a city like water park that had rivers of water take you where-ever you wanted to go. I also remember dreams of flying, very lucid and I was able to have good control over the path of my flight. I know at times I must have used this technique when I was semi aware of my dream states, but alas, I have not mastered this and still to this day sometimes fuse my reality to the dream I am experiencing. These fears may be tied to something from a time in the past. An earlier struggle with forces which at the time may have overpowered me on some level. When the mind continues to play out old themes, and puts the body under duress during a time when you should be rested and most relaxed is a troubling notion. Clearly something continues to gnaw at my memories. Understanding the reasons behind the dreams, behind the self lies a depth that is difficult to penetrate. For what ever torment I may discover, I will find a way to overcome those earlier injuries. I will face them and defeat those fears. I know that they often result in my subconscious acting out on earlier learned programming from my childhood and it continues to surface from time to time. Understanding why these dreams sometimes happen, and investigating how one can achieve better sleep states I ventured to study deeper into how our conscious states can hold us captive, from earlier learned states in our childhood if we let them continue to operate subconsciously, even in our sleep. From disciplines like developmental, cognitive, analytic, comparative and cultural psychology we learn that the first 6 years of life are extremely important in shaping our consciousness and conscious habits. The training of our minds on how we approach the world is largely impacted in these years and embeds the programming of our consciousness. Also Enneagram theory provides us with some examples of ancient teachings supporting these findings. We learn from the ancient mystics, as well as those who study Quantum Mechanics, that there is a connection between the disciplines. A theme that shares both realms is the idea that frequency, resonance, and consciousness are all interconnected. Matter is only subject to sensory perceptions, and the farther you travel down the path of physics in the quantum level, you ultimately find that there a fewer and fewer particles, and more and more space. This is the reason why Newtonian mechanics (gravity) fails to work at quantum levels. The forces I speak about are hard to imagine, but the evidence is building to support such claims about frequency or wave mechanics. Understanding that we have the power to change our subconscious mechanisms and habitual thought patterns is the first step in reforming our conscious routines. Training on such a level is possible, but is difficult to do. Techniques can be found in the literature such as Zen Buddhist or Taoist teachings that breaks the mind from previous habits. If one looks at the wave patterns created by fear; they tend to have low sine wave forms. If one looks at the wave pattern created by love; they tend to have a very high sine wave form. It’s sometimes hard to understand why I shift to these nightmares of my creation. The dreams are so real that I often awake in the middle of the night in a cold sweet and the sound of my voice uttering a plea like shout. I then try to analyze just what my dream was about, looking at the circumstances and again wondering why I was not quite able to change some of the attributes that I have been able to do so before. It’s interesting that our childhood nightmares are embedded into a perennial conscious memory of the event. There are details that we can remember about our worst nightmares, but conversely we cannot recall other personal information about our experiences that quite frankly should be more important to us. I want to face these nocturnal demons of my consciousness, but to do so I must meet them in my dreams. They do not often come to me in everyday life during my conscious wakefulness. They come to me as cowards in my dreams, when my defenses are often subdued and ill-prepared to confront them head on. I have tried, on occasion, but I have found I need to train more to overcome their presence. I am looking forward to the day I subdue them. A good night’s sleep is enjoyable and should not be wasted on bad dreams that are avoidable, and controllable. I’d like to have my lucid dreams concentrate on more meaningful ideas. Tend to seem withdrawn, intellectual, focused, quiet, objective and unemotional, knowledgeable yet unforthcoming, and self sufficient. Fives are very private people, easily drained by too much interaction with others, sometimes even by another’s presence nearby. Fear of intrusion and need to have their own clearly acknowledged space, as to retire to recoup their energy and think things through. As an observer, it is difficult to identify what I feel and think at the moment. Privacy is needed to partially review past and future event, and what I think and feel. Need to be allowed to go away and consider how I think and feel before I can give an accurate answer when asked what I think and feel about some things. Fives compartmentalize their lives. Activities and interest each have their place. I like to anticipate and prepare myself. Seem superior – which may simply be detachment, or seem to have a deeper insight and see clearly through things. exception of specialized collections related to interests. Withdrawn, distrustful, critical, intellectually arrogant unable to commit, very controlled, and out of touch with feelings and the world. Sensitive, perceptive, dedicated, objective and creative thinker, who can combine their sensitivity and analytical skills to be wise rather than knowing. Fives learned that it was possible to be safe in an intrusive world where their very survival felt threatened, by withdrawing into their minds and becoming self sufficient They minimized hurt by distancing from sensations and emotions and unable to escape physically, they could become untouchable by being a spectator of events in their own lives. As children they may have had intrusive, domineering, violent or smothering parents. They recall, for example, having their favorite toys destroyed because we haven’t got room for them; or during a confrontation, I’d turn into a robot. I would just move the feelings away. It’s protective. Some fives rather than feeling threatened by people, felt their survival threatened because they were left to fend for themselves. Avarice = an emotional preoccupation in which fives feel they are always potentially lacking the means for safe survival, and so are avaricious of whatever enables them to feel secure and independent. This is not usually anything material, as they minimize physical needs, but information which enriches their inner world and helps them feel prepared for the onslaughts of the outer world. An intense need – sort of greed – for private space and time, both for safety’s sake and for nourishment. Tend not to volunteer information unless asked. Anything that forces fives to deal with feeling is stressful. May pose as sevenths (epicure). Cheerful and gregarious – but actually I’m miles away. Look for options to escape. When secure – fives become more eight like (boss). Take charge, be definite and forthcoming, and access their anger. Find it easiest to express feelings through touch, and this is enhanced in security with a release of physical enjoyment. Type eight qualities can also be seen in the quiet vigor with which fives protect their own space. The exchange of confidences in one – to – one Relationships enables fives to feel safe. Sharing secrets keep the world at bay, and means people trust each other, so fives need not fear intrusion or loss. Also confidentiality in the physical expression of friendship or love which feels safer than verbal expression. Fives know they are distanced from the world and crave connection, but since it means making themselves vulnerable to feelings, and carries the risk of intrusion, it can be difficult for them. However much they may like another person, anything, experienced as invasive or demanding will make them back off, whereas they will be attracted towards a person who allows them their own space. As relationships become more intimate, non-verbal aspects of relationship are important. Touching allows them to feel present without the need to say how they feel, which they often do not know until they are alone. The reliable presence and consistency of another person allows them to feel safe. Successful intimate relationship depends on partners understanding and respecting fives need for privacy. Partners also need to understand that although fives may be demonstrative and may appear to have the relationship in just one of their compartments, once they commit themselves the relationship is central, and probably the most important fact in their lives. A possible pitfall for fives in their personal growth is confusing detachment, which comes easily to them with higher awareness of non-attachment. Non-attachment allows feelings, experiences, and things to come and go, knowing that the universe is abundant. Fives try to re-create the feeling of sufficiency by pulling in and holding on to the necessities for survival. Detachment is a way of holding back, and enables them to deny that they care about things and are attached. As they start to allow their energy to flow more freely and share it with others, they discover that it is self-renewing. They also discover how much they have been attached to their necessities. The inner knowing that they will be taken care of by life itself gives a simultaneous ability to be involved and yet to let go. Omniscience is the experience of essential mind in which all knowing is available without the need of think or accumulate knowledge. Fives pacify their unacknowledged fears by acquiring information. As their personal growth takes them more into them realm of immediate experience and non-attachment to their personality, they discover they have access to wisdoms other than that of the intellect. Safety is found in an inner experience of already knowing all they need to know. Our personality type is recognizable, but our personality – the experiences, memories, dreams and aspirations, and what we do with them – IS OUR OWN! Though our personality developed as a strategy to help us cope with the outer world as infants, by the time we are adults it is an automatic biased perspective. The Unique and heartening aspect of the enneagram theory is that our “false” personality reflects, as in a mirror, our highest self. It is not an enemy to be conquered but our best friend, showing us which lessons we need to learn and how to learn them. Being safe and physically comfortable are priorities. This Passion might be more accurately described as Resentment. Anger in itself is not the problem, but in Ones the anger is repressed, leading to continual frustration and dissatisfaction with themselves and with the world. Pride refers to an inability or unwillingness to acknowledge one’s own suffering. Two’s deny many of their own needs while attempting to “help” others. This Passion could also be described as Vainglory -pride in one’s own virtue. Deceit means deceiving ourselves into believing that we are only the ego self. When we believe this, we put our efforts into developing our ego instead of our true nature. We could also call this passion Vanity our attempt to make the ego feel valuable without turning to our spiritual source. Envy is based on the feeling that something fundamental is missing. Envy leads Fours to feel that other possess qualities that they lack. Fours long for what is absent but often fail to notice The many blessings in their lives. Fives feel that they lack inner resources and that too much interaction with others will lead to catastrophic depletion. This Passion leads Fives to withhold themselves from contact with the world. Thus they hold on to their resources and minimize their needs. This Passion might be more accurately described as Anxiety because anxiety leads us to be afraid of things that are not actually happening now. Sixes walk around in a constant state of apprehension and worry about possible future events. Gluttony refers to the insatiable desire to “fill oneself up” with experiences. Sevens attempt to overcome feelings of inner emptiness by pursuing a variety of positive, stimulating ideas and activities, but they never feel that they have enough. Lust does not only refer to sexual lust: Eights are “lusty” in that they are driven by a constant need for intensity, control, and self-extension. Lust causes Eights to try to push everything in their lives – to assert themselves willfully. Sloth does not simply mean laziness, since Nines can be quite active and accomplished. Rather, it refers to a desire to be unaffected by life. It is an unwillingness to arise with the fullness of one’s vitality to fully engage with life.